Excellent service. Very helpful in explaining what I needed to bring in. – cathy m.
Did a great job and was done fast. – Jeff F.
Love the services, I’m spending great time looking at my children’s memories. – Lupe S.
Prompt and courteous –Pam M.
did a great job – thomas n.
Great service and quick. Easy to get to. Highly recommended. – Diane D.
Ben was a very nice guy. After an original setback because of quality issues, he graciously re-did the transfers and they came out much better the second time. Very timely work. Under-promise, over-deliver. Thanks! –Rafael N.
This place was top notch! They delivered three VHS to DVD copies in just a couple days. DVDs are great quality and came in protective covers. I’d highly recommend them. – Claire B. They were cordial, friendly and very customer service oriented. Very good experience and I will go there again! – Nancy B. Great customer service! – jacci e.
Wonderful quality and quick service. Definitely recommend! – Carol T.
They were very accomodating! – lorena p.
The man I had contact with was very nice and even checked one of my VCR tapes to see if it was good ,while I was there – Carole V.
Great service, friendly, helpful, personalized, safe for precious memories on tape or video, will definitely use again – Tim B. Would go back to this business to transfer VHS to DVD. Received dvd’s back sooner then expected. – Theresa D.
Very Friendly and quick drop off / pick-up. I will be back !! – Paul M.
The quality of the work was good and they completed the job in a short time. I am very pleased with their service – Linda P.
The people were very nice and git the job done quickly. – Terry M.
Terrific service and great product. Quick turn-around time too. Highly recommend. – Linda G.
Fast and efficient service. – Randall C.
good work, very quick turnaround, nice to deal with. – Tami A. They did a nice job on our videos, we’ll most likely use them again! – Mary K.
The service was friendly and fast. – Jeff M.
Lightning FAST service! – Doug C.
Very nice owner and fast turn around with my dvds. A very happy customer! – Kathy G.
Fast turn around time, very pleased. – Donna B.
excellent … very quick processing ! – Gary K.
Very pleasant store clerk. Owner very helpful. Recieved dvds in a timely manner. – Darlene M.
Fast & friendly service. Fastest turn around time I’ve experienced so far with this type of service. – Larry R.
Good quality and quick turnaround. – Betsy R.
pleasant staff! so helpful & informative. quick service!!!! very impressed! – Vicki W.
Good, friendly people who know thier stuff! – laura s.
Nice friendly people. Immediate service. Price was very reasonable. I didn’t mind the trip there; there’s a Starbucks on the corner! – Debra D.
Very helpful staff. Transfer was completed in a couple of days. Great results with this service. – Jim W.
They were very nice and helpful. – Dina C.
Excellent and quick service – Susan P.
Service was fast and done well. – joe s.
I was told my service would take about a week to complete when I dropped it off. I was called two days later .that it was ready for pickup. The work, transferring old video to DVDs , was outstanding! WonderFul work and I will go back again! – Ken k.
Extremely friendly, and service was super quick. Would go here again! – Patricia M.
Wonderful staff, they made my DVD’s in record time!! Thank you! – Pamela C.
Welcoming place; great service; considering it was the holiday season, the turn-around time was very fast. – elaine p.
The staff was extremely kind and extremely helpful, they had my DVDs ready within a week. I will definitely be going back in the future and i will also be recommending my friends and family to go here as well. – Naomi F.
Everything completed as expected. Satisfied with experience. – John C.
they are professional and helpful…good people – Carol B. The staff was pleasant and very efficient. I received my order much sooner than expected. I have already referred three people to this company. – Helene V.
the gentlemen there were very helpful. we had some very old tapes that we wanted turned into dvds. they were honest in what the potential results might look like. – Larry G.
Owner was very professional and friendly. – Stephanie S.
Excellent service and products Justin E.
My home videos turned out great!! Classic Media did a great job and very quick turnaround. – Bridget Z. Staff was very friendly and work was very professional. – Pat C.
Extremely friendly, helpful, and service oriented. – david n.
Very pleasant people to deal with, and produced an excellent product. – John E.
They were very courteous and made my DVDs so fast!!! – Jeanine A. Friendly and helpful – did a good job on the transfers – Judith V.
They managed to do a few dvds that I specifically wanted for my gaughters with different moments captured. They kept it all organized correctly – Dorothy J.
I appreciate the friendly, professional service. All work is done in-house, therefore, I trusted them to copy my Super 8 reels to DVD. I will recommend them to my family and friends. – Frances H.
Very professional! Highly recommend. – Jeanine S.
very friendly staff and they got the work done quick. – colleen g.
Thanks for making my experience a really good one. – Noreen D.
Thanks for working on my tapes. I hope to be able to do the next ones soon. – Karen B. Thanks for your 24 hr turn-around of my videos to discs even though it was the UK system to the US system – CaROLINE G.
I really appreciate the individual and friendly way you treated me and my production needs. – Barrie M.
I greatly appreciated your service and the resulting product. Your location is convenient. – Kathleen G.
Thanks, nice work! – Marianne H.
We appreciate their discretion in not copying if they didn’t think it would come out well. The DVD’s we got are good quality and we felt they are fair in their pricing. – Karen S.
The service was exceptional and the product wonderful. I can actually watch my wedding video now!! – Cristen O. Thank you for keeping our memories – Denise K.
We were so happy with the work, we are having more transfers done. Thank you. – Rosa P.
They did a nice job and were very quick in doing my dvd’s. – Erin D.
They did a terrific job – william h.
Outstanding phenominal work done – have recommended to several people and will be taking many many more jobs to them. Work is exceptional and people are friendly and helpful. They are definitely a cut above the rest!! Love that they do all their own work also. – Mary K.
They were very accommodating and easy to do business with. You can trust them to treat your precious video/photos with care. I would recommend them to anyone. – Lynn S.
transferred old VHS tapes to DVD, superb quality. – Mary A. Fast and quality services. Good group of people. – bob h.
They were very friendly and efficient. They converted our Hi8 tapes to DVD and the picture quality was very good. Jeff C.
Very nice people & would do business with them again – Cindy L.
Very friendly service from the owner, Joe. – Joseph M.
They did a great job and the turn around was quick. – Jim M.
Classic Media Productions did a very good job with my home movies. – Gene D.
great job, thanks so much ! Walter K.
completed the work well before requested time. – Kathleen W.
Very good experience. Very pleased. – Bob W.
Friendly, competent owners. Very fast turn around time, especially during the holiday season. Went back to have more copies made of my DVDs and they did them while i waited! Can’t ask for better customer service than that, especially one week before Christmas. – Peggy M.
The owners and staff of Classic Media provide courteous and high quality, professional services to their clients and custiomers. I have been completely satisfied with them and their results.– Vern L.
Very prompt and helpful! Would definately use them again : ) – Kim P.
Very good job, very honest. Turnaround was quick. – dale a. Love the personal experience and very accomodating – Mary Rose B. They even gave me a tour of the ir production studio suites! VERY COOL! – Linda B. 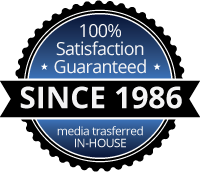 Fast turn around time of converting VHS tapes to DVD’s.– Stephen G.
They did a great job in a timely manner – Roberta D.
I have used Classic Media’s services to preserve family memories several times and they have never failed me. Not only is he job done well, but it’s done in a timely manner. A bonus is that their fees are very reasonable compared to others in the same market. Use them. They’re good! – RM A.